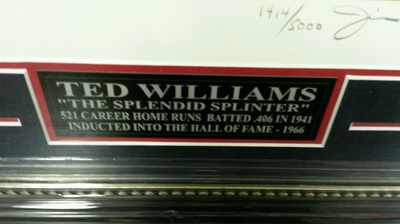 Williams is regarded as one of the greatest hitters in baseball history. He was a two-time American League Most Valuable Player, six-time batting champion, 17-time All-Star, and a two-time Triple Crown winner. He finished his career with a .344 batting average, 521 home runs, and a .482 on-base percentage, the highest of all time. His batting average is the highest of any MLB player with 302 or more home runs. Williams was inducted into the Baseball Hall of Fame in 1966 in his first year of eligibility. 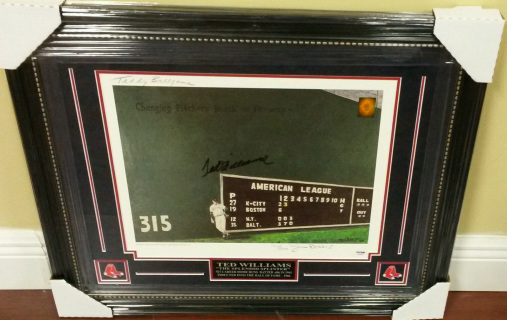 Hand signed Boston Red Sox horizontal 16x20 limited edition art print with a black sharpie by Ted Williams, includes a certificate of authenticity from PSA/DNA. Hand signed Boston Red Sox vertical 8x10 matted photo with a blue sharpie by Ted Williams, includes a certificate of authenticity from Global Authentics. 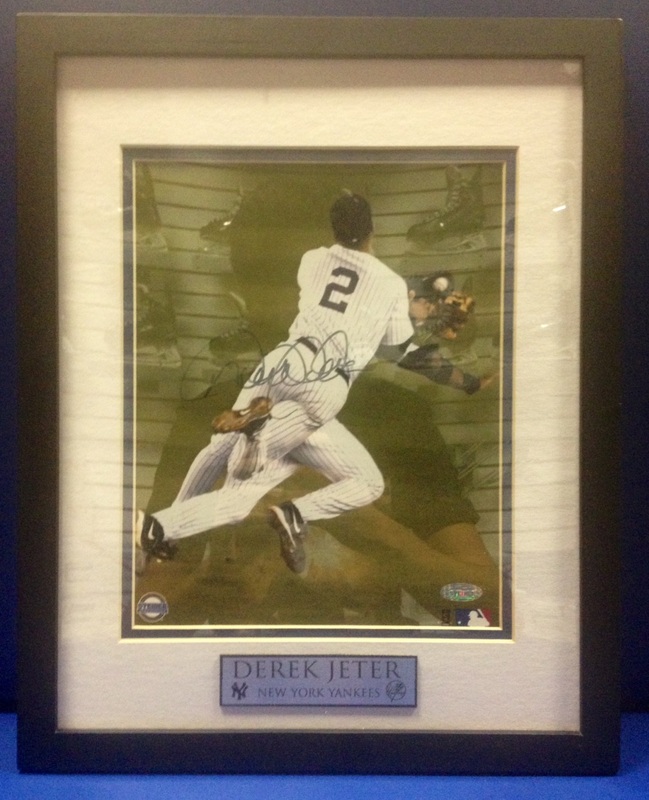 Hand signed New York Yankees vertical 8x10 framed photo with a black sharpie by Derek Jeter, includes a certificate of authenticity from Steiner Sports. Derek Jeter Official. Hand signed New York Yankees RARE vintage vertical 8x10 glossy photo with a blue sharpie by Mariano Rivera, includes a certificate of authenticity. 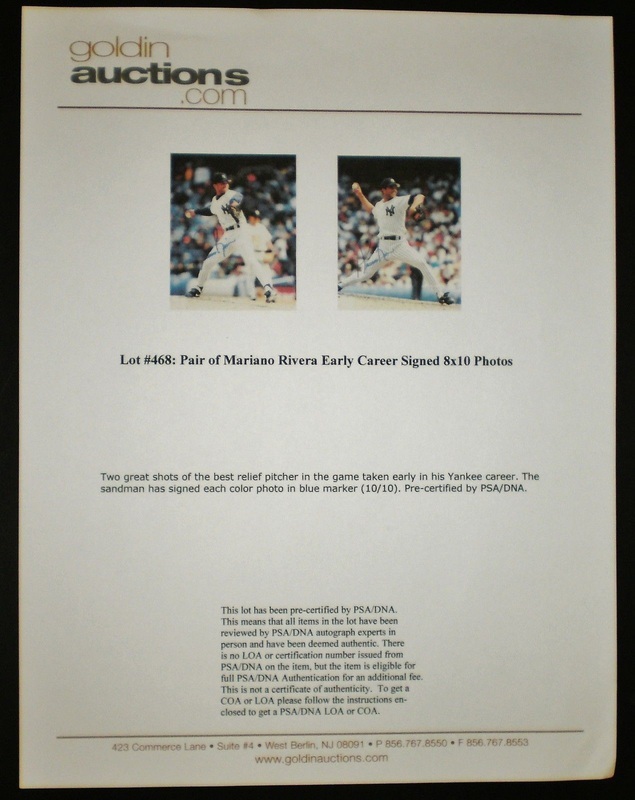 Was obtained through Goldin Auctions and is pre-certified by PSA/DNA so you can be sure you're bidding on an authentic Mariano Rivera signature. In addition to the PSA pre-certification this Rivera signed photo also comes with a Goldin Auctions/PSA Certificate of Authenticity (COA). 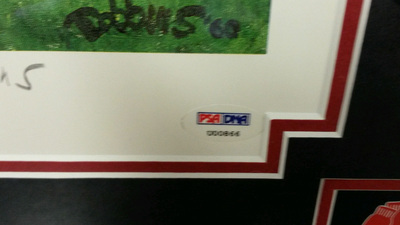 It will come with a Goldin Auctions/PSA COA and a PSA/DNA Pre-Certification letter. 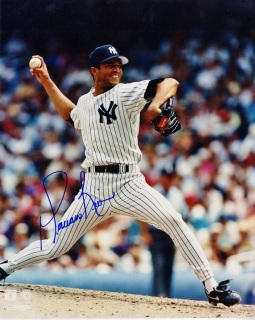 Nicknamed "Mo" and "Sandman", Rivera spent most of his career as a relief pitcher and served as the Yankees' closer for 17 seasons. A 13-time All-Star and five-time World Series champion, he is MLB's career leader in saves (652) and games finished (952). Rivera won five American League Rolaids Relief Man Awards and three Delivery Man of the Year Awards, and he finished in the top three in voting for the AL Cy Young Award four times. Hand signed Baltimore Orioles RARE limited edition collage vertical 8x10 glossy photo with a blue sharpie by Cal Ripken Jr., includes a certificate of authenticity. Nicknamed "The Iron man", is an American former baseball shortstop and third baseman who played 21 years in Major League Baseball (MLB) for the Baltimore Orioles (1981–2001). A 19-time All-Star and two-time American League (AL) Most Valuable Player (MVP), Ripken is perhaps best known for breaking Lou Gehrig's record for consecutive games played, a record that had stood for 56 years and many deemed unbreakable. Ripken surpassed the mark on September 6, 1995 by playing his 2,131st consecutive game, which fans later voted the "Most Memorable Moment" in MLB history. Ripken voluntarily ended his 17-year streak at 2,632 games in 1998. 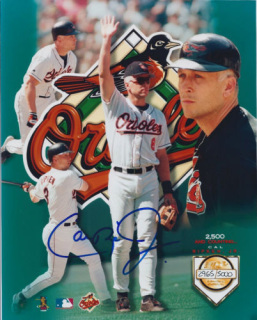 One of his position's most offensively productive players, Ripken tallied 3,184 hits, 431 home runs, and 1,695 runs batted in during his career, and he won two Gold Glove Awards for his defense. 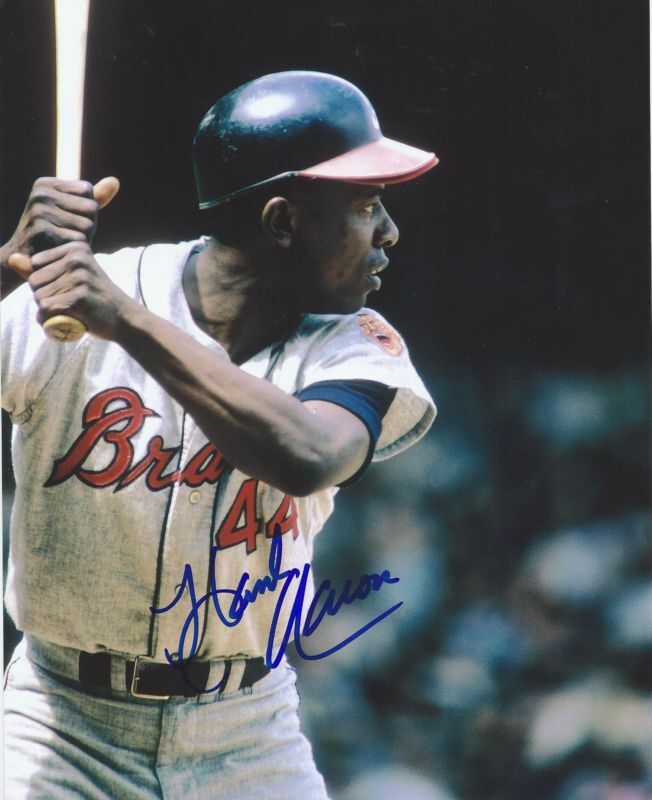 Hand signed Atlanta Braves vertical 8x10 glossy photo with a blue sharpie by Hank Aaron, includes a certificate of authenticity. his career. 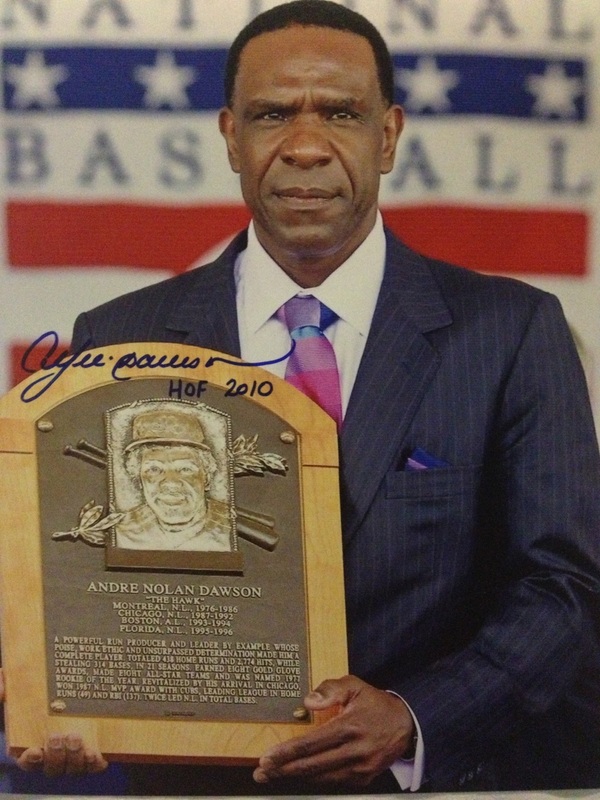 In 1999, The Sporting News ranked Aaron fifth on their "100 Greatest Baseball Players" list. He held the MLB record for career home runs for 33 years, and he still holds several MLB offensive records. He hit 24 or more home runs every year from 1955 through 1973, and is the only player to hit 30 or more home runs in a season at least fifteen times. 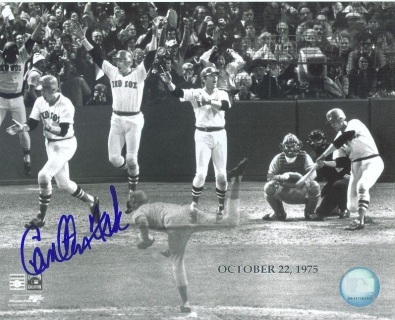 Hand signed Boston Red Sox RARE black and white 1975 World Series home run horizontal 8x10 glossy photo with a blue sharpie by Carlton Fisk, includes a certificate of authenticity. Nicknamed "Pudge" or "The Commander", is a former Major League Baseball catcher. During a 24-year baseball career, he played for both the Boston Red Sox (1969, 1971–1980) and Chicago White Sox (1981–1993). Fisk was known by the nickname "Pudge" due to his 6'2", 220 lb frame. 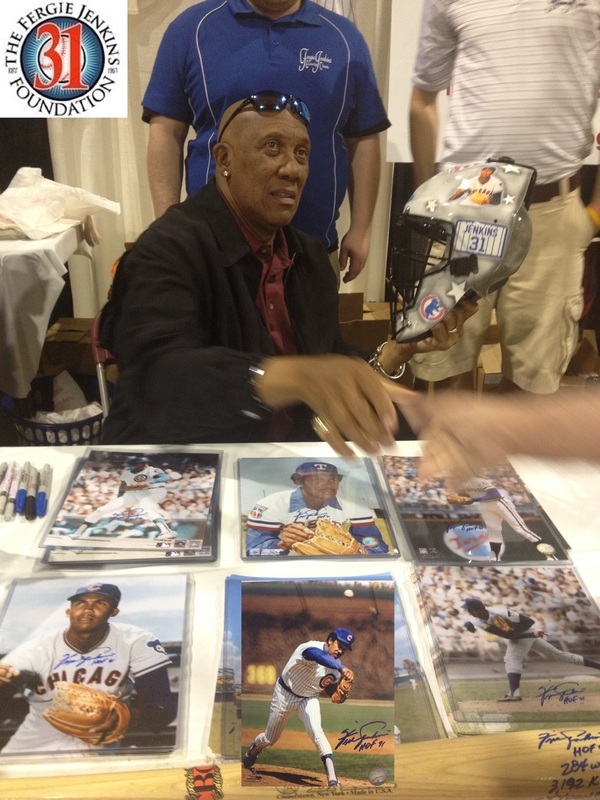 He was the first player to be unanimously voted American League Rookie of the Year (1972). Fisk is best known for "waving fair" his game-winning home run in the 12th inning of Game 6 of the 1975 World Series. At the time of his retirement in 1993, he held the record for most home runs all-time by a catcher with 351 (since passed by Mike Piazza). Fisk held the record for most games played at the position of catcher (2,226) until June 17, 2009 when he was surpassed by another "Pudge," Iván Rodríguez. Fisk still holds the American League record for most years served behind the plate (24). Fisk was voted to the All-Star team 11 times and won 3 Silver Slugger Awards which is awarded annually to the best offensive player at each position. Fisk was known as a fierce competitor, a superb handler of pitchers and a natural on-field leader. He was elected to the Hall of Fame in 2000. 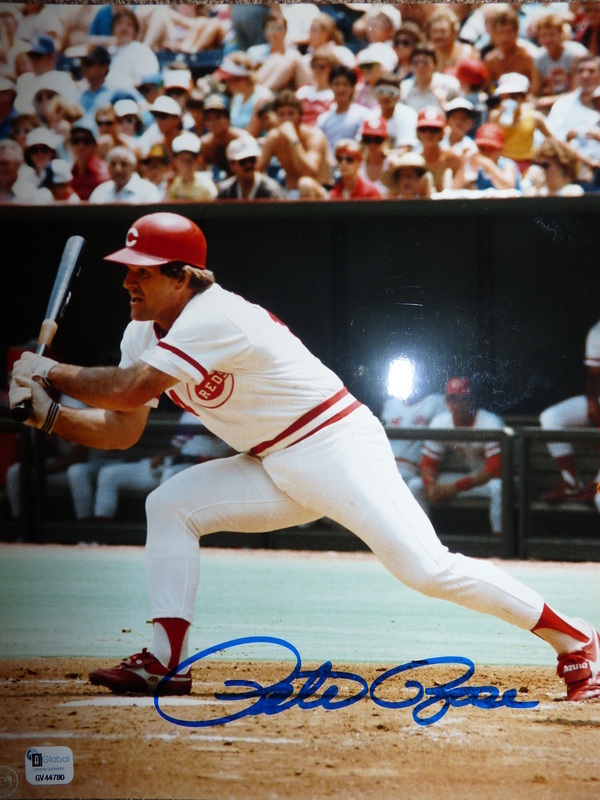 Hand signed Cincinnati Reds vertical 8x10 glossy photo with a blue sharpie by Pete Rose, includes a certificate of authenticity from Global Authentics. 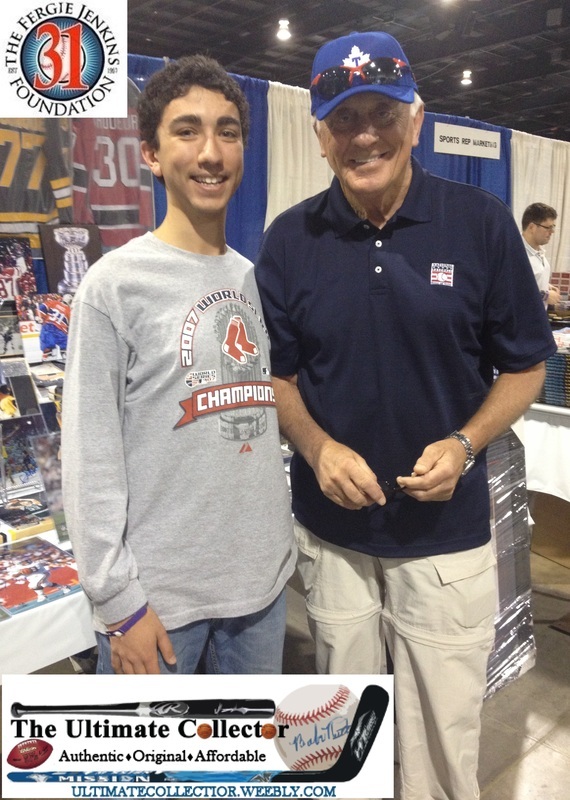 Nicknamed "Charlie Hustle", is a former Major League Baseball player and manager. Rose played from 1963 to 1986, and managed from 1984 to 1989. Rose, a switch hitter, is the all-time Major League leader in hits (4,256), games played (3,562), at-bats (14,053) and outs (10,328). 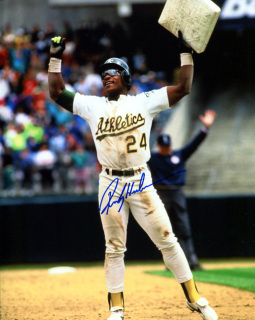 He won three World Series rings, three batting titles, one Most Valuable Player Award, two Gold Gloves, the Rookie of the Year Award, and made 17 All-Star appearances at an unequaled five different positions (2B, LF, RF, 3B & 1B). Hand signed Oakland Athletics vertical 8x10 glossy photo with a blue sharpie by Rickey Henderson, includes a certificate of authenticity. 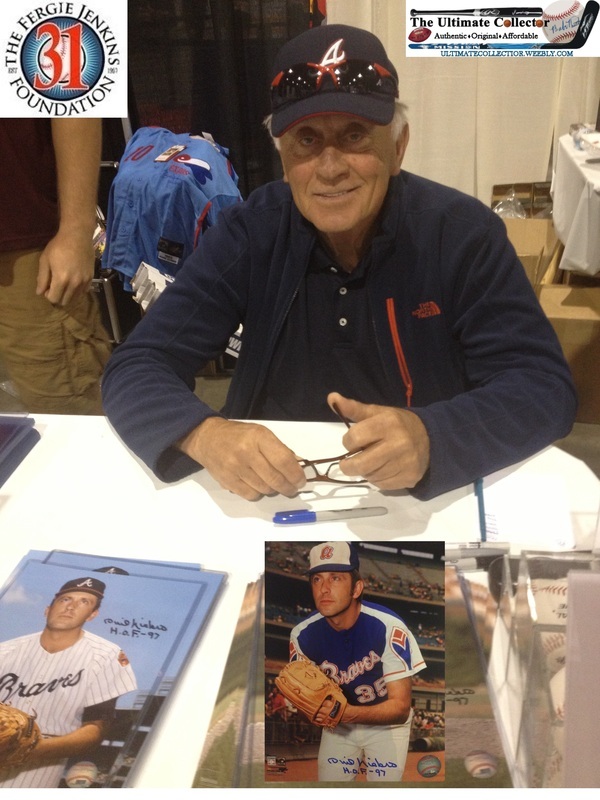 Nicknamed "The Man of Steal", he is widely regarded as the sport's greatest leadoff hitter and baserunner. 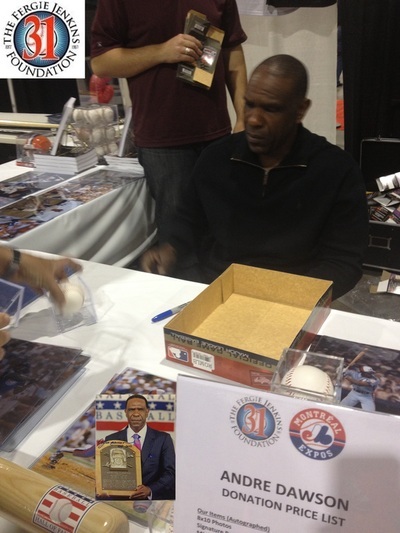 He holds the major league records for career stolen bases, runs scored, unintentional walks and leadoff home runs. At the time of his last major league game in 2003, the ten-time American League (AL) All-Star ranked among the sport's top 100 all-time home run hitters and was its all-time leader in base on balls. 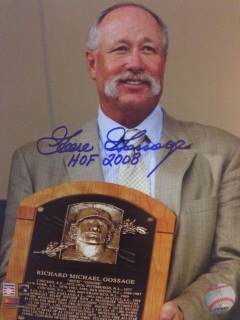 In 2009, he was inducted to the Baseball Hall of Fame on his first ballot appearance. Hand signed Boston Red Sox vertical 8x10 glossy photo with a blue sharpie by Carl Yastrzemski, includes a certificate of authenticity. He was elected to the Baseball Hall of Fame in 1989. Yastrzemski played his entire 23-year baseball career with the Boston Red Sox (1961–1983). 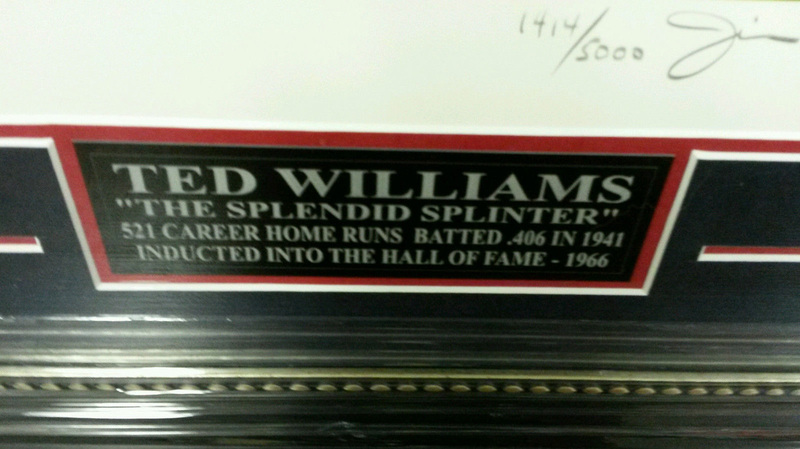 He was primarily a left fielder, with part of his later career played at first base and as a designated hitter. Yastrzemski is an 18-time All-Star, the possessor of seven Gold Gloves, a member of the 3000 hit club, and the first American League player in that club to also accumulate over 400 home runs. He is second on the all-time list for games played, and third for total at-bats. 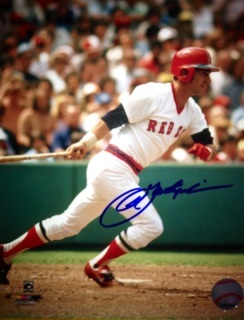 He is the Red Sox' all-time leader in career RBIs, runs, hits, singles, doubles, total bases, and games played, and is second on the team's list for home runs behind another Red Sox great, Ted Williams, his predecessor in left field. In 1967, Yastrzemski achieved a peak in his career, leading the Red Sox to the American League pennant for the first time in over two decades, in that season being voted the American League MVP, and being the last winner of the triple crown for batters in the major leagues. Hand signed St. Louis Cardinals vertical 8x10 glossy photo with a blue sharpie by Ozzie Smith, includes a certificate of authenticity. 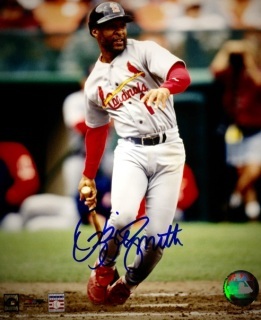 Nicknamed "The Wizard" for his defensive brilliance, Smith set major league records for career assists (8,375) and double plays (1,590) by a shortstop (the latter since broken by Omar Vizquel), as well as the National League (NL) record with 2,511 career games at the position; Smith won the NL Gold Glove Award for play at shortstop for 13 consecutive seasons (1980–1992). A 15-time All-Star, he accumulated 2,460 hits and 580 stolen bases during his career, and won the NL Silver Slugger Award as the best-hitting shortstop in 1987. He was elected to the Baseball Hall of Fame in his first year of eligibility in 2002. 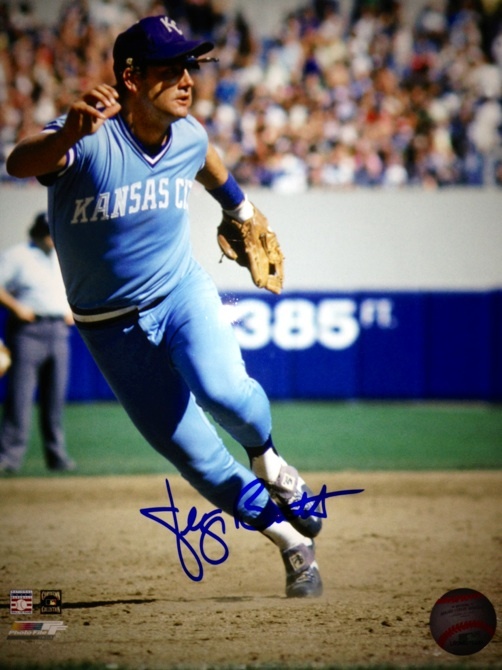 Hand signed Kansas City Royals vertical 8x10 glossy photo with a blue sharpie by George Brett, includes a certificate of authenticity. He played his entire 21-year baseball career for the Kansas City Royals. Brett's 3,154 career hits are the most by any third baseman in major league history, and 15th all-time. Brett is one of four players in MLB history to accumulate 3,000 hits, 300 home runs, and a career .300 batting average with the others being Hank Aaron, Willie Mays, and Stan Musial. 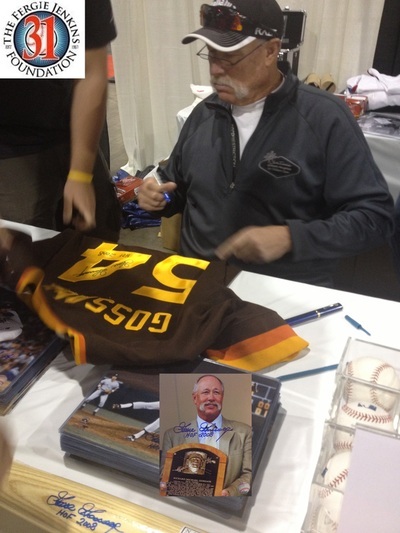 He was inducted into the Baseball Hall of Fame in 1999 on the first ballot. Hand signed Texas Rangers vertical 8x10 glossy photo with a blue sharpie by Nolan Ryan, includes a certificate of authenticity. Nicknamed "The Ryan Express", is a former Major League Baseball pitcher. 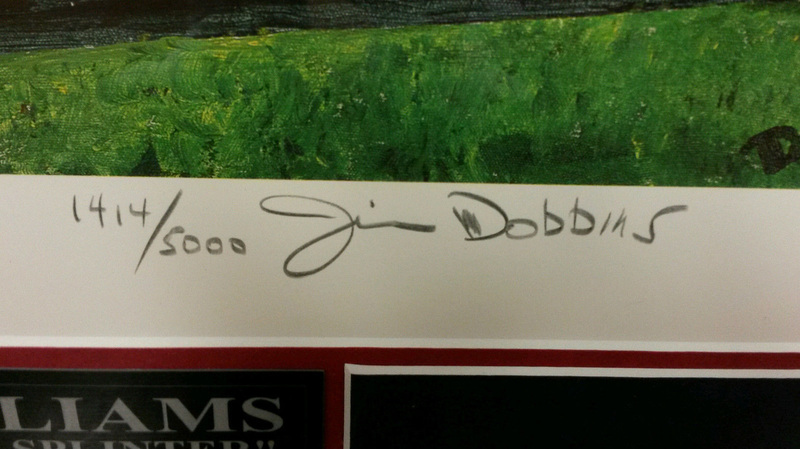 He is currently principal owner and CEO of the Texas Rangers. During a major league record 27-year baseball career, he pitched in 1966 and from 1968 to 1993 for four different teams: the New York Mets, California Angels, Houston Astros, and Texas Rangers. He was inducted into the Baseball Hall of Fame in 1999. 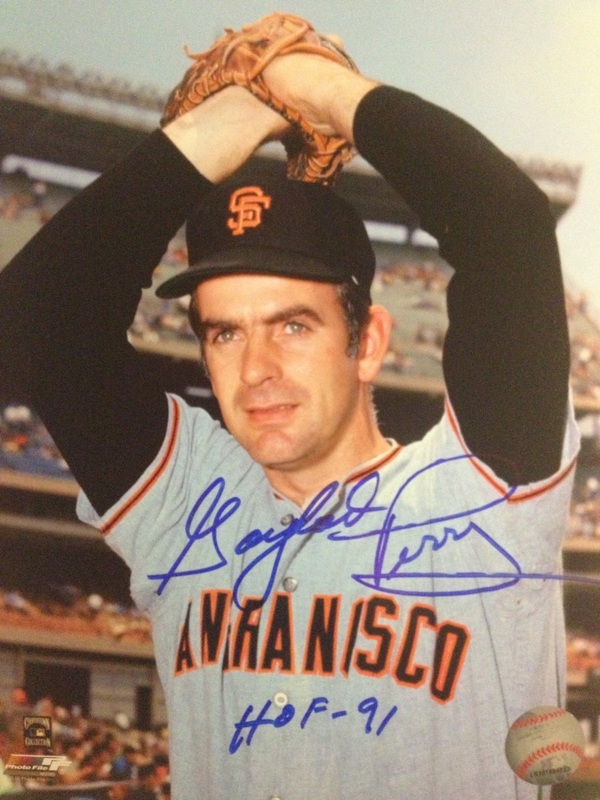 Hand signed San Francisco Giants vertical 8x10 glossy photo with a blue sharpie by Gaylord Perry, hand signed in person, see below! 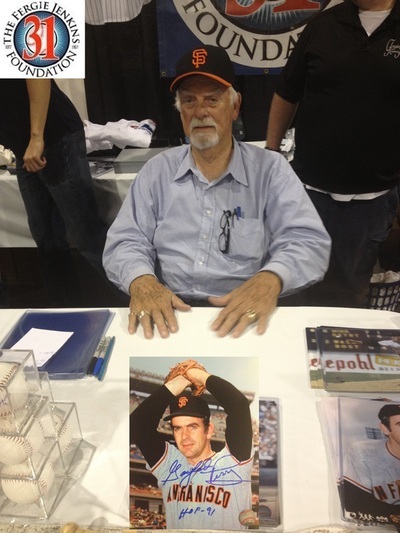 He pitched from 1962 to 1983 for eight different teams. 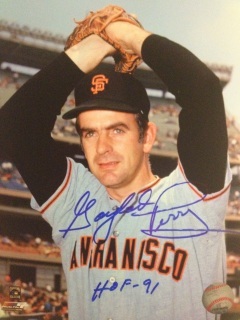 During a 22-year baseball career, Perry compiled 314 wins, 3,534 strikeouts, and a 3.11 earned run average. 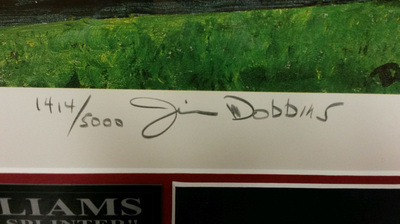 He was elected to the Baseball Hall of Fame in 1991. Featured is an official major league baseball autographed perfectly in blue pen by Bob Feller! 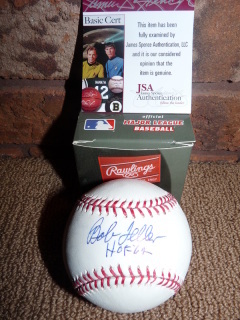 Ball features a crisp signature with Feller adding a RARE 'HOF 62' inscription! 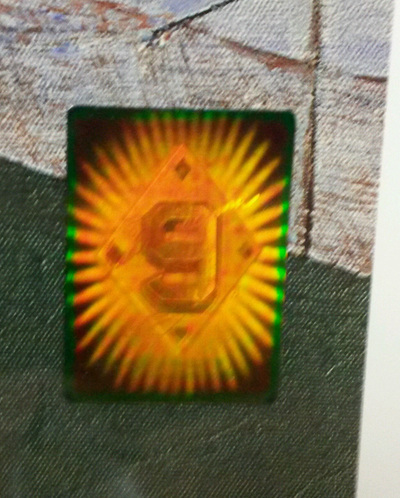 Accompanied by our serial numbered, tamper proof hologram and matching number Certificate of Authenticity, straight from Main Street Cooperstown, NY! 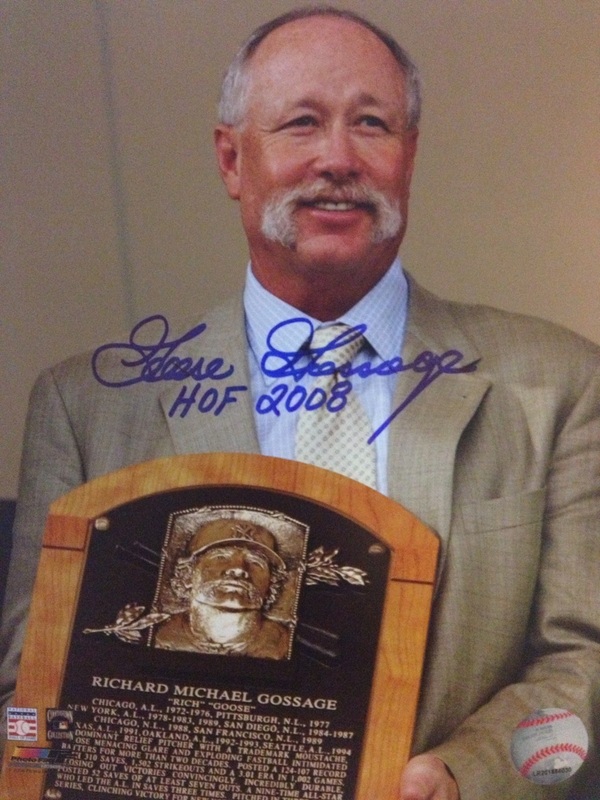 Every Legends Are Forever autographed item is guaranteed to pass the rigors of PSA/DNA or JSA (James Spence Authentication), the two industry leaders. One of the best right-handed pitchers in baseball history, Feller was a prodigy who entered the major leagues when he was 17. Feller played for the Cleveland Indians from 1936 to 1956, his career interrupted by four years of military service during World War II. 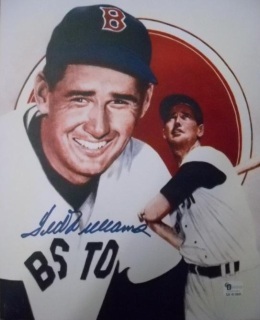 He became the first pitcher to win at least twenty games in a season before the age of 21, threw three no-hitters and twelve one-hitters (both records at the time of his retirement), led the American League in strikeouts in seven seasons, and pitched 279 complete games. Feller was renowned for his fastball, which was officially clocked at 98 miles per hour by the U.S. Army (A record at the time, later bettered by Nolan Ryan), although it is commonly believed that he could throw much harder than that. Ted Williams called Feller "the fastest and best pitcher I ever saw during my career", and Stan Musial believed he was "probably the greatest pitcher of our era."